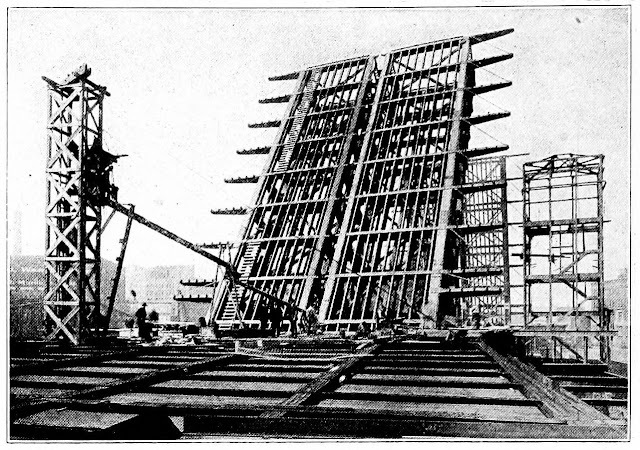 April 7, 1919 -- The Chicago Daily Tribune details the progress that is being made on the new Michigan Avenue bridge, noting that “The roof is off one-third of the big Kirk soap factory that for thirty years has been one of the premier hideosities and unseemly barriers of this town. The walls are falling down from the fifth story downward.” [Chicago Daily Tribune, April 7, 1919] Within a few days, the paper reports, “… it will be possible to look northward form the south bank of the Chicago river and the site of Fort Dearborn and catch a glimpse of the trees of Lincoln parkway beyond the water tower.” Each day “hundreds of people” stop to watch the progress of the bridge, the long-awaited connection between the south and north districts of the city, “a colossal work that means the attainment of light, air, space, beauty, and convenience in a district which for a generation has been so squalid, so ugly and so inutile that it would have disgraced an Asiatic capital with 3,000 years of makeshift and short-sightedness and stupidity behind it.” The article looks breathlessly toward the changes in Michigan Avenue that the new bridge will bring … “Not since the London county council, at a cost of millions of pounds, opened up Kingway, has any capital offered builders of vision such an opportunity to convert visions into superb realities.” Even before the bridge is finished nearly 70 percent of the property owners on Michigan Avenue north of the river have signed an agreement to exclude from the street “all business establishments incompatible with the status of a show street … which – so real estate experts agree – will fix the destiny of the street and save it from the long period of transition from an outworn residence street to a high class business street …” The article concludes, “If you take that walk amid the derricks and the debris you will realize … how every dollar of the $13,000,000 you voted for North Michigan avenue development is going to come back tenfold to the community in convenience, beauty, and increased values … So take that walk.” The above photo shows the Michigan Avenue bridge, today's DuSable bridge, nearing completion in 1919. April 7, 1910 – Chicago Police Chief LaRoy T. Steward tells managers of the city’s beaches that “Bizarre bathing costumes, whether for women or men, will be censored by the police” [Chicago Daily Tribune, April 8, 1910] at the city’s beaches in the coming summer. Uniformed police officers will be stationed at the doors of every beach dressing room and will inspect the bathing attire of patrons as they come out to the sand. “If they escape the initial inspection,” the Chicago Daily Tribune reports, “there will be other bluecoats along the shore to correct the oversight. 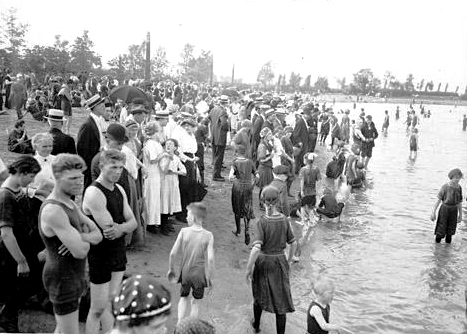 The chief says that special attention will be given to the men’s costumes, but women will also be closely monitored “lest there be a too marked inclination to follow objectionable styles permitted at some ocean beaches near eastern cities.” Regarding the fashions of women bathers, the rules place “an official ban on the sheathe and directoire styles in feminine bathing costumes. Bloomers cut to hang loosely must be worn under the skirt and must reach to the knees. Sleeveless garments will not be allowed, although quarter length will be considered sufficient covering for the arms.” Men must follow these directives … “The vanity of men of athletic mold is to be restrained when they display chests or shoulders by a too low cut of their bathing suits. Also, the back must be well covered. Trunks alone or the one piece bathing suits for men are not to be considered and the trunks of the two piece suit must not be unduly abbreviated.” Chief Steward observes that his hope is that the city’s beaches will have the “reputation of being the best conducted in the country.” The above photo shows the Diversey Parkway beach five years later in 1915 with everyone playing by the rules. April 7, 1893 – Huge waves crash into the mouth of the river from the lake, tearing ships from their moorings “as if the heavy hawsers with which they were fastened had been merely bits of twine.” [Chicago Daily Tribune, April 8, 1893] At 2:30 a.m. the first wave sweeps into the harbor, and four vessels are ripped from their moorings, damaged heavily, and swept toward the lake. 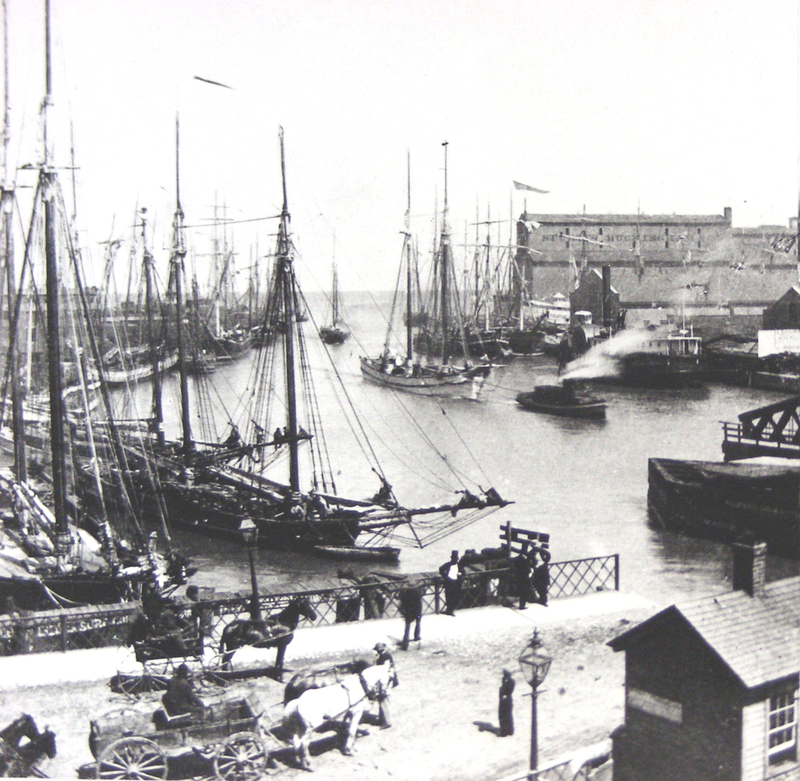 A second wave follows the first, and The City of Venice is grounded at the life-saving station while the Mabel Wilson becomes stuck in the mud, broadside to the channel. The A. P. Wright strikes the pier and then becomes stuck fast in the middle of the channel, stopping just 20 feet from the grounded Mable Wilson. One lake captain says, “These sudden squalls in the lake cause a great movement of water in one direction. They soon spend themselves and a reaction takes place. Then a squall will come from an opposite direction to the first and make the swell larger. Such a swell striking the shore at the mouth of a river will force the water into a huge wave which will carry everything before it.” Boat owners from Lincoln Park to Racine, Wisconsin report their boats and boathouses are missing as the waves do damage all along the shore north of Chicago. April 7, 1955 -- Walsh Brothers, Inc. is the low bidder at $334,995 on a contract to construct an arcade along the south side of the Auditorium building to clear the way for the Congress Street expressway's route to Grant Park. 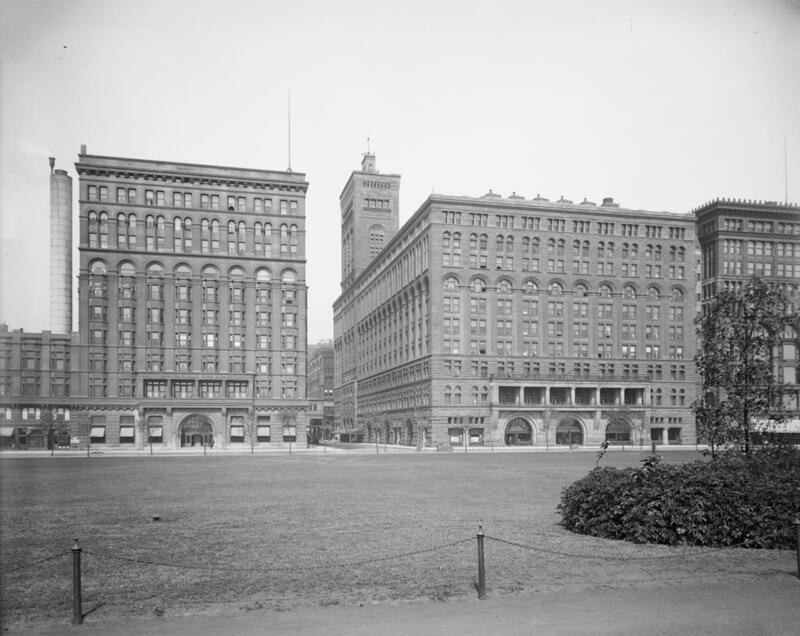 The 1889 building, designed by Dankmar Adler and Louis Sullivan, is the last of six buildings along East Congress Street to be arcaded. A part of the building that will be lost is a bar on the southeast corner believed to have been designed by Frank Lloyd Wright at the beginning of his career. The photo above shows the Auditorium as it existed in 1900.